Tottenham travel to West Bromwich Albion on Saturday wary of tough opponents whose turbulent season may be coming to a positive conclusion. Needing one more win to secure Premier League status, the Baggies will come into the game desperate to put an end to their dismal run of form at home and give their fans something to look forward to next season. This is very much the time of season where form goes out of the window. If there is a lesson to be learned from West Brom’s recent travails, it is probably that overachievement can be a club’s undoing unless it is acknowledged as such. Their eighth place finish in 2012-13 saw manager Steve Clarke acclaimed as one of the more promising British managers in the Premier League and made a genuine star of Chelsea loanee Romelu Lukaku, but also led to inflated expectations that were impossible to meet. Despite their high league placing, West Brom lost seventeen league games that season – the same number as Sunderland, who finished seventeenth – and it was obvious to all observers, at least those outside of the club, that if they failed to replace Lukaku then they would struggle this time around. None of the many players signed to replace the colossal Belgian have done the job: Nicolas Anelka, Victor Anichebe and Stéphane Sessègnon arrived on permanent deals, Matěj Vydra and Scott Sinclair came in on loan and Saido Berahino was promoted from the reserves. Shane Long kept his place as the club’s starting striker, but due to his contractual situation it was inevitable that he would leave in January. This theoretically spread the goal threat around the front four and gave West Brom a more dynamic, rounded attacking unit. Rather than simply giving the ball to Lukaku and allowing him to bulldoze his way through opponents, they would be a fluid, collective attacking quartet. The plan has not worked: Lukaku contributed seventeen goals in his season on loan, the same number as the seven (7) attackers to have played for the Baggies this season. So it was that Steve Clarke was relieved of his duties and Pepe Mel was drafted in. The change of manager was somewhat at odds with the club’s recent policy. The Baggies board, guided by the now-departed Sporting Director Dan Ashworth, learned from Tony Mowbray’s naïve attempt to play attractive football and essentially Keegan his way to survival. Thus, their recent strategy has been aimed at ensuring survival above all else. The hiring of Roy Hodgson was a masterstroke, and the template put in place by the England boss should have kept West Brom away from trouble for a few years, the same way it kept Fulham safe until Martin Jol destroyed it this season. The system is sound and the squad is full of well-organised, defensively diligent players, making them hard to beat. While the football is not the best, the basis is there to build and expand once long-term stability is secured. As one would expect of any squad assembled using Hodgsonian principles, West Brom’s is a team full of experienced ‘triers’ who prefer to counterattack, or at least play reactively: guys like Steven Reid, Liam Ridgewell and Billy Jones are Hodgsonism personified and their performances and results under the similarly-minded Steve Clarke were exactly what you would expect from such an alliance of flair-free industry. The Lukaku-inflated performances last season were very much an anomaly and should have been recognised as such. So while results this season were perhaps underwhelming, Clarke was at least a coach whose ideas were applicable to his players’ abilities and he should have been allowed to continue. The hiring of current manager Pepe Mel is relatively hard to understand: the Spaniard prefers a more expansive, continental style of play, not quite as progressive as the likes of Roberto Martínez or Brendan Rodgers but definitely at odds with the tactical preferences of his squad. Mel also comes with a mixed record. His Real Betis side punched well above its weight with some beautiful play and finished seventh in La Liga in 2012-13, largely due to Mel’s tactics and the sublime talent of Basque playmaker Beñat Etxebarria – the sort of player he does not have at his disposal at the Hawthorns – but they bombed this season and will finish the season rock bottom of the division. Mel was fired in December following a 4-0 derby loss to city rivals Sevilla. The relationship between the new manager and his players has been difficult to read, given the obvious mismatch between his preferences and their abilities. He has tried to vary things, using a midfield diamond and times and a back three at others, but he seems to have twigged that all he can really do is play the system the squad knows best: two banks of four, soak up the pressure, score on the break. Last weekend’s victory away to Norwich puts West Brom within touching distance of survival and Mel has already said that he will play an unchanged lineup against Tottenham, the fitness of his players permitting. That means no starting place for the returning Claudio Yacob and Chris Brunt, arguably the two best players at the club, which should come as some relief to Spurs fans. Ben Foster will play in goal, with Steven Reid at right-back, Gareth McAuley and Jonas Olsson in the centre and Liam Ridgewell at left-back. 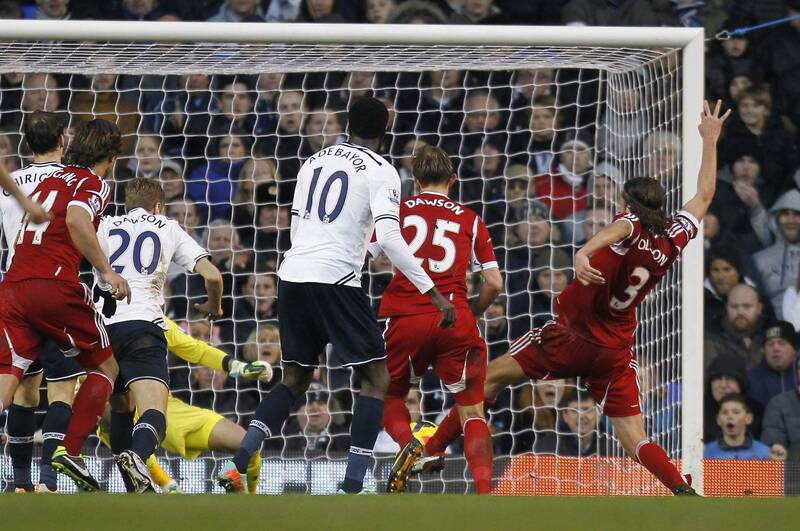 The side is set up to play with an old-fashioned flat back four, so the tracking-averse Christian Eriksen’s positioning on the left should not be exploited as it was by Glen Johnson at Anfield, for example. 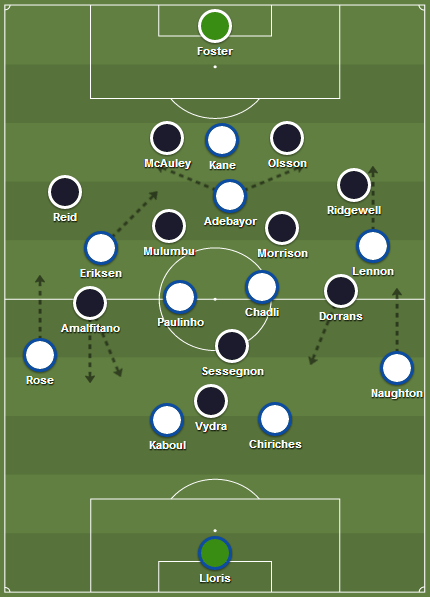 Youssouf Mulumbu and James Morrison will play as the double pivot, in the tried and tested destroyer/passer combo. The two make 2.4 and 2.8 tackles per game respectively, as well as 3.1 and 1.1 interceptions. Mulumbu also makes 54.7 passes per game, completing 85.2%. In short, these figures mean they will be tough to break down – if Tottenham are to get any joy, it will be going down the flanks. Marseille loanee Morgan Amalfitano will play on the right and comes into the game in a rich vein of form, having scored excellent goals in each of his last two games. His intelligent and varied positioning will be key to the Baggies’ attempts to build attacks and create chances and Danny Rose will have to be particularly communicative to ensure that the Frenchman is picked up wherever he pops up. On the other flank, Graham Dorrans will play a more orthodox role, coming inside and looking to create chances. He has played 2.1 key passes per game this season and while Amalfitano’s wandering may be key to creating space, Dorrans’ passing will be West Brom’s primary weapon from open play. Stéphane Sessègnon and Matěj Vydra will be the starting strike pairing but it would be a surprise if either was to do anything: they have made a combined thirty-eight Premier League appearances this season but have only scored five goals between them, taking a combined 2.3 shots per game. On paper, this should be a tough, gritty game in which Tottenham’s greater individual quality prises open the home side and leads to a second win in five days for the surely departing Tim Sherwood. However, with the Spurs’ manager’s tendency to land his team tactical muddles and with the home side motivated by the tantalising prospect of survival, it would not be a surprise should West Brom take at least a point. Expect the first goal to decide more or less everything.